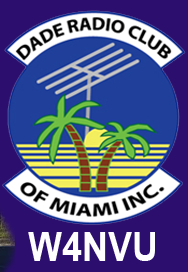 April 2014 – W4NVU – Dade Radio Club of Miami Inc.
Meeting was called to order at 19:39 with 30 present. We have a quorum. The minutes for last month were posted on the website. Miguel asked if there were any objections to the minutes as posted on the website. There were none. Brandon made a motion to accept the minutes, seconded by Bill. The minutes are accepted as posted. Corresponding Secretary – Lloyd brought in mail that was given to Esther. Treasurer – Esther advised that she is collecting dues for 2014. Please see Esther to pay your dues. Esther is taking $5.00 per ticket tonight for a raffle of a Baofeng radio. Miguel also has radio carriers for sale for $5.00 each and the money will go to the Hambulance project. Jason advised that no one contacted him to run for any of the positions. He asked if anyone present was interested in any of the positions and there were none. A motion to accept the above slate was made by Lee, seconded by Julio. A vote was taken and the above are now the new officers and directors of the Dade Radio Club. Congratulations to all! Miguel thanked everyone for his last three years as President and thanked everyone for their help. Club Elmer/PIO – Miguel advised that we have a press release for Field Day. Nothing else at this time. Armando is in the other room testing. Miguel announced that we need an Event chair for Field Day. John Dalnes volunteered. Thank you John. Field Day will be June 28 and 29th. We will be joining the Everglades Club, Coral Gables Ares Races at JohnD.CampbellAgriculturalCenter at 18710 SW 288 Street in Homestead, FL33030 again this year for Field Day. Steve Taylor spoke to the members. We have requested a 1 by 1 call sign of W4B and are waiting for the approval. We had 9 stations last year and will have more this year. Bring your equipment, antennas, and tents. We have a shelter if it rains. We will have food like last year. He suggested that everyone be there by 10 AM for a pre-meeting and to test your equipment so that we are ready to go at noon. Steve’s cell number is 305-796-9371 W1HQL. Miguel will bring the Hambulance. Go the ARRL website and look up the rules and regulations for what you can do and can’t do. There will be 3 modes of operation: cw, phone and digital. If anyone has any connection to the media, please let them know what is going on. Let them know that this is a working emergency communication event. We get extra points too. D-Star is up and running. It is being used a lot by tourists on the cruise ships. One ham operator from the hurricane net said that he can’t hit the D-Star. John advised that he has no problem from North Miami. Apparently, the operator was using a hand held. Lloyd advised that Robert from Massachusetts gave a great presentation at the NationalHurricaneCenter meeting yesterday about the Boston Marathon bombing last year and Hurricane Sandy. He explained how everybody got coordinated and pulled together. If it were not for the Ham infrastructure it would have been a bigger disaster. Ham radio was the only sustained communication after the events. Each operator had to wear 2 or 3 hats and they all pulled together. Ray advised that whatever the event, you are sometimes required to wear other hats. He suggested that everyone get cross trained. There are also online tests with FEMA – the ICS 100, 200, 700 and 800. Miguel announced that there is also Sky Warn Training at the Coral Gables Races Meeting on May 10th. Sign up online at the Sky Warn Website. The 147.000 is being worked on and is almost finished. The tower was sold to AmericanTower and Miguel has contacted them for access. Amar is the project manager there. Miguel is waiting for a response. The 147.760 – Ray advised that it is at UM and is up and running. It will be used this weekend. It accepts everything. The 224.200 – Julio advised that it is up and running at his house. It is up 20 feet. It eventually will be placed at Miami Senior High. The 51.660 – Ray advised that it is a transmitter only. The 444.200 – Carl advised that it is working up and running. He is changing a few things out. The Digipeater – 144.390 is being worked on. It works on and off when it feels like it. Emergency Committee Chair is now Brandon. The net control coordinator is Miguel and Carl is the contact. Armando came out of the testing room and announced that we have 3 new Techs and 2 new Generals tonight. Roe Serralta passed his general and Richard Zaveleta passed his tech. Congratulations to everyone! Lloyd is the new char for Hamfest. He is working on obtaining a new site. Miguel spoke about the Hambulance communication vehicle. It was ½ purchase and ½ donation from AMR. He showed us photos of members working on it. He explained that we need a lot of items for it. The list is attached to the agenda tonight. If you have any of these items, please let us know. Someone from the club will even pick them up. You can also make a donation online. Carl advised that we also need a dehumidifier. The Flamingo Free Flea will take place at UM physics parking lot this Saturday, April 19. David advised that on May 4 there will be a small bike ride for Lotus House. It is a shelter for woman and children. There will be about 300 riders. He needs 5 ham operators. See David if you can help. Julio and Miguel spoke about a Dade Radio Ham Camp Out in October when it gets cooler. It will happen sometime in October at a park at 152. It’s a nature park. We can put up tents, they have a shelter, we can set up radios and make a campfire. More info TBA. Tom advised that Sky Warn is using AllStar. He opened the floor to an open forum to discuss anything. Brandon corrected the info on the Coral Gables net to take place on Wednesday not Tuesday. He is giving 10 meters another shot on side band. Miguel advised that Miami Dade has practice nets. See the 2nd page of the agenda. Ray advised that Miami Dade Fire is going to narrow banding. There was a discussion as to what types of generators will be used at Field Day. The raffle for the Baofeng radio was won by our new Tech Richard Zaveleta. Congratulations! Where the club members were going to go for dinner was discussed. Virgil made a motion to adjourn, seconded by Esther. The DRC meeting was adjourned at 20:44.